[New for 2011] I know that the first Mars flavors didn't really impress me, but when I heard about the three new 2011 flavors, I still got excited none the less. What can I say, I'm a sucker for candy bars! I love how on the top of the container it says "REAL Ice Cream". 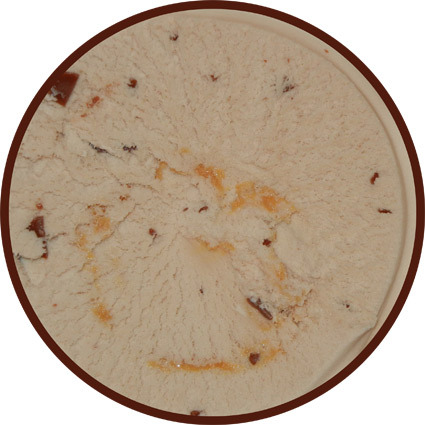 The exact description is Chocolate Malt ice cream, smooth caramel and chocolatey chunks. Should be good right? And here is the treat. The swirl looks pretty weak, but maybe it will get better...oh why keep you in suspense, it doesn't get any better. In fact, the caramel is a pretty minor player here. 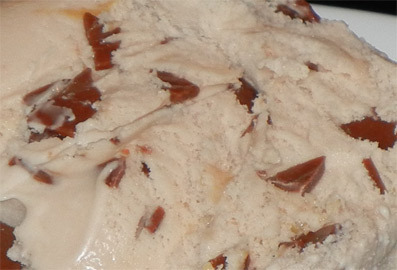 It adds to the overall flavor, but at no point did I go "mmmm, now that was a nice scoop of caramel". Wow, check out all those chunks! That's just crazy! There are a fair amount of milky way shell-like chunks, but this shot makes it look like a million bits. The chunks arent really thick enough to add a nice thud to your bites, nor do they add a huge chocolate factor. Like the caramel, it accentuates the faux milky way flavor but does not stand out by itself. That leaves the base chocolate malt ice cream. It's an ok ice cream, nothing special, but not awful either. Thankfully it's chocolate malt, and not a straight overpowering malt flavor like we found with Breyers Whoppers flavor. 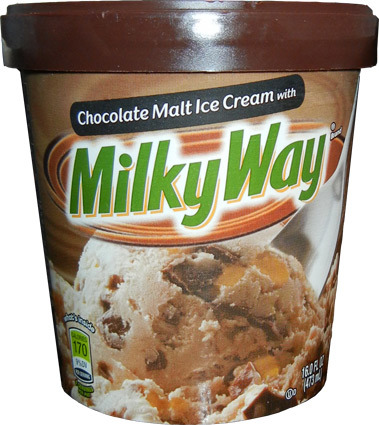 Overall I'd say that they did attempt to create a milky way flavor, but at the same time, I call this one a boring fail. On our first scoop, both me and my wife were thrown off by a weird vibe to the whole treat. Menthol was the first word that popped into her head, but I just thought of another way to describe it. If the dollar store tried to make a knock off Milky Way, this is probably how it would taste. It's a weak milky way flavor with an artificial (or replacement) vibe to it. I just finished the pint off for the second scoop and the word that comes to mind is boring. Maybe the ice cream can't decide if it wants to be ice cream or candy bar and so it gets lost in the middle. I guess I have to disagree with the first review. This is a delicious carton of ice cream, in fact I have been looking for it and haven't found it in many stores in South Dakota. Can you just eat a fourth of a pint----"No Way" you eat the whole pint. Try it and you will want to buy more. I found it a treat from heaven. Just tried this ice cream (found it at a bargain store for pretty cheap) & I agree that this is a very boring ice cream! I thought the malt taste was pretty good, but the rest was just so underwhelming.